Kemco has been nothing if not busy lately, keeping 3DS owners occupied with a steady stream of eShop JRPGs, and Justice Chronicles is the latest in this line. Though it suffers from a number of common ails of its ilk — like awkward translation, a generic cast, and uneven presentation — Justice Chronicles does have some neat touches, including an interesting story setup and fun combat. It's not a must-play by any means, but for JRPG fans with the right expectations it's worth a look. When Justice Chronicles kicks off players find themselves in the boots of Kline, a new recruit in the Grinsil Special Operations Brigade. Kline and his friends live in a world in conflict; trouble's brewing in the surface realm of Illumica, and popular belief holds that it's all thanks to the subterranean Laft, an underground land of warring tribes. Animosity between the two groups is boiling up, and Kline and his crew are sent to infiltrate Laft and find out what's really going on below the dirt. Not long into the operation Kline ends up making a detour of sorts when he falls into a Faustian accord with the God of Death; he gains the power to protect what's important in exchange for his soul. From there, things ramp up rather quickly, and he assembles an ad-hoc band of adventurers — including a soldier, shrine maiden, and witch — for a journey to uncover the truth behind the trans-terrestrial conflict and end it for good. 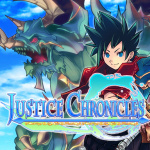 Though the characters are predictable tropes and the writing is uninspired — more on that later — there are at least some interesting themes in Justice Chronicle's story, and we enjoyed following along more than expected. Their quest takes Kline & co. on a classical RPG journey through towns and dungeons aplenty, though in a departure from the norm a Super Mario World-esque world-map with discrete selectable areas replaces the overarching Dragon Quest-style traversable map of most JRGPs. While that might seem like a step backwards, we appreciated it here; it makes individual areas manageable, keeps progression relatively snappy, and gets rid of the grind of backtracking through enemy-infested paths. That's especially nice here because random encounters — which pop up as your party moves around in hostile environments — are very, very frequent. 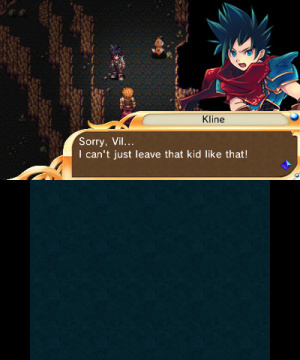 It's not exactly 8-bit days, but at times it does feel like Kline can't take a step without being pounced on by angry beasts. Happily, once the battle music starts rolling Justice Chronicles shows a relatively thoughtful and enjoyable combat system that borrows elements from some of the best. From Dragon Quest and Shin Megami Tensei, it takes a first-person perspective and neatly arranged rows of sprite-based foes; from Final Fantasy, it borrows the ability to switch up your three-person frontline on the fly by tagging in members from your larger party; and from Persona, it runs with the central conceit in the form of 'Shells' — personalized monster companions that bond with and fight alongside each of the main characters. Along with the genre-standard set of regular attacks and skills, Shells help shake things up, and make combat much more interesting than it otherwise would be. Each character can equip a Shell, and different combos will yield different Partnership Effect bonuses when they're paired up. As in early Persona games, not everyone will get along as well from the outset; 'Best Tags' represent optimal pairings of humans and Shells, but everyone can level up their bond with their Shells (measured in 'Partona') by buddying up in battle. Shells can shield their partners from damage and even unleash rampaging 'Anger Skills' when they soak up enough of it, so they're a big help when things get tough. Add in equippable magic, Linked Skills that let your human party members team up, and a six-way elemental weakness circle, and there's plenty to think about in Justice Chronicle's encounters. There are also a few helpful modern QOL features, like cute badges for each character that show who's set to attack which monster, and the merciful combination of fast-forward and auto-battle that makes low-level fights bearable. Aside from the basic loop of battling in dungeons and chatting with NPCs in towns, you'll be able to keep busy with a basic crafting system, using resources scattered around dungeon floors to upgrade your weapons and armour, and by taking up side quests — either monster-hunting or material-gathering — from witches. 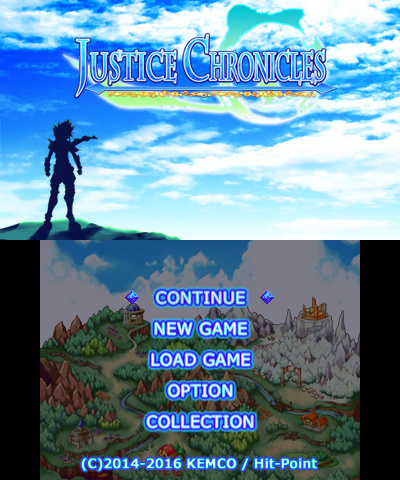 All of these systems come together reasonably well, and even if it all feels a bit too familiar — for RPG veterans, it's like thumbing through a book you've already read several times over — Justice Chronicle's no-frills take on the genre makes for a decent diversion. In terms of presentation, however, things are much less more consistent. Graphically, Justice Chronicles recalls the 2D days of the 32-bit era with a functional but generally unimpressive style. Character and enemy sprites look nice, but backgrounds are boring, and the four-way animation for eight-way movement makes everyone moving in a non-cardinal direction look like they're sliding along on ice. There's also no stereoscopic 3D effect at all — an unfortunate reminder of Justice Chronicle's Android origins. That said, there are a few things worth celebrating. The status menu shows the current party sitting around a campfire, for instance, letting you check on your characters' health and EXP as they roast s'mores. 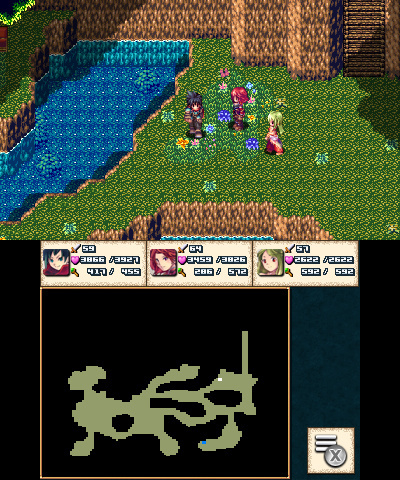 There's also a handy live-map of each location on the bottom screen — a nice upgrade over the mobile port. Character portraits look good, enemy sprites animate nicely, and there's no trace of the jittery movement we've seen in other Kemco mobile ports. And while the backgrounds still give off an unfortunate RPG Maker vibe, they're not as distractingly tiled as Alphadia's. 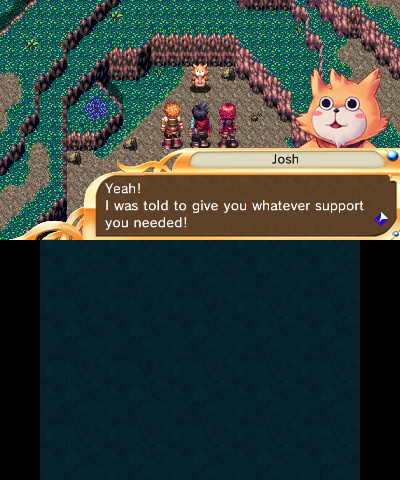 One aspect that's sadly a definite downgrade from Alphadia, however, is the translation. It's back to business as usual in Justice Chronicles, and that means lots of awkward phrasing, massive tone swings, intra-sentential shifts between British- and American-isms, and scanlation-level frequencies of the phrase "It can't be helped!". The script also suffers from a tendency towards long-windedness and exposition-dumps in general; one early cutscene lasts nearly 20 minutes, and that feels like an awfully long time to be clicking away at the 'A' button. It's not all bad though, and occasionally Justice Chronicles' script shines with some genuine humour — Kline is a goofy guy, and whether from his antics or the general tropiness of the proceedings, we chuckled more than a few times while playing. Finally, a surprisingly catchy soundtrack rounds out the package, pairing a rocking battle theme with Mega Drive-style spacey synth work, ethereal Celtic airs, and generally tuneful songs with a variety of instrumentations. Our only complaint is that the loops are quite short, and you'll hear the same ones quite frequently, but Justice Chronicles is an RPG best played in short sessions for plenty of reasons, and the repetition sticks out less in spurts. The boss battles were a huge jump in difficulty. It does allow you to continue fighting by losing half your money. Money is fairly easy to grind for so continuing after your team dies is fairly painless. Spending as much as you can before a boss battle is wise. It took me 35 hours to reach the ending credits. I have not played the postgame. Its light year better then Grinsia another Kemco title. Only two Kemco games I played of this generation. Shadowgate needs to come to eshop VC that was a great Kemco game. I've been curious to see what kind of JRPG Kemco could make ever since I experienced the JRPG-ish plot of Boulder Dash EX. It's a shame to see it's just average, though. @AlexSora89 I enjoyed Boulder Dash EX. @AlexSora89 Yesss, EX is one of the better ones in my opinion (and that's what comes to mind when I see the name Kemco). I only know the Japanese version (imported it like two years ago), but the cut scenes tell me the plot was goofy fun. 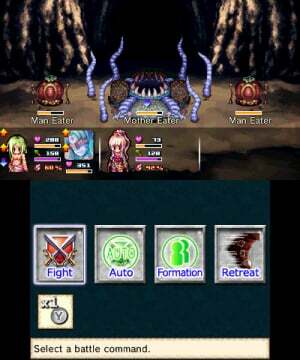 Ew... another SNES RPG looking. 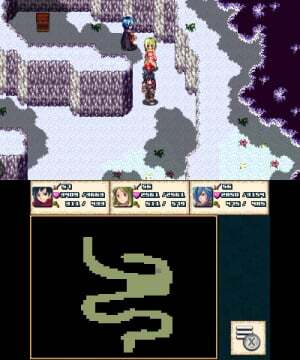 Looks like another Final Fantasy VI but with well designed characters. Better play FF III NDS. @Anti-Matter The caves seemed like a cross between NES and SNES. Most SNES RPGs had better graphics. It was still worth playing. The graphics are nowhere near SNES Squaresoft level. You say this used to be an Android game? Sounds like the perfect fit for my Android-powered fake 3DS. It actually took the lack of plot in most incarnations of BD and made it feel EPIC! Mad props for that. AHAHAHA...Look at that cat thing! The eyes! Ahahahahaha!!! !